Home Product Book Recyclable Newspaper Pouches Are The Latest Craze! “They clog and choke and wind around everything! These plastic bags are wrapped around everything big or small!” Plastic pouches whether small or large just stuff the landfills and the ones which manage to blow away fill the gutters, pollute the streams and oceans. They cause a threatening effect on both marine and terrestrial ecosystems. As petrochemicals are used as the raw materials for making the plastic pouches they contain toxins and are lethal to animals as well as humans! Which is not the case in paper products; newspaper pouches. India’s former environmental minister stated that “15,000 tonnes of plastic waste is generated every day, out of which only 9,000 tonnes is collected and processed but more than 6,000 tonnes is not even collected! Whereas according to the world economic forum, by 2050 the plastic trash is on a track to represent more mass in the oceans than all the world’s fish combined! Doesn’t all these facts makes you change your choice so easily? 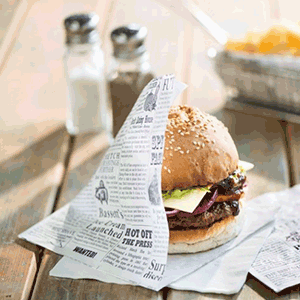 Recycling, reusing and using eco- friendly newspaper pouches is the latest craze today! And won’t you like to be a part of the fashion? For yourself and for the sake of saving our environment! In the line of thought there are an incredible number of details and inputs that are involved in making of these newspaper pouches, a lot more than you can of just see through your eyes! 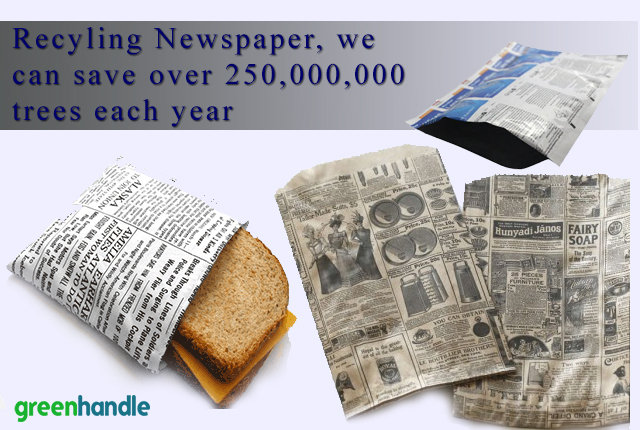 Newspaper pouches have high known advantages these are biodegradable, environment friendly, inexpensive and practical to use. These give you everything from durability to re-usability. You can carry these newspaper pouches to carry your day today items for purchase and bring then to schools, malls, offices, grocery shops etc. 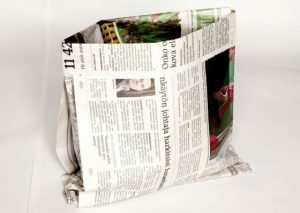 Newspaper pouches can be spacious and sturdy, these are also light and comfortable to carry. 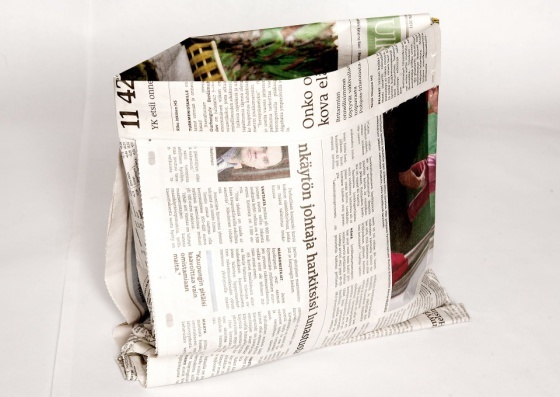 Old newspapers, magazines, or books can also be recycled to produce the raw material for these newspaper pouches. Hence they can easily decay and would not pile up in the dump sites to deteriorate the land resources. Newspaper pouches and bags help to turn organic waste into super quality compost. At Greenhandle we assure you that all the products supplied to you are eco friendly as much as possible. We sell you small or large, all kind of newspaper pouches to incorporate an eco friendly habit in your lifestyle. Old and scraped newspaper that is generally thrown away is taken in use by us for making these newspaper pouches. We also give you customized pouches on which you can get a print according to your will. All the raw materials like the glues and vegetable based inks are certified compostable and petroleum free. Such newspaper pouches are very inexpensive both for the vendor and the customer. You get the pouch for free which the vendor has purchased at purchased at minimal cost. The production of plastic uses more that 6 percent of the global oil resources, which again is a reason that leads to severe natural resources depletion. There are millions of plastic bags used globally around the world each year. But the newspaper pouches do not need and machinery and hence save fuel and natural resources. Craft of hand can be used to make these pouches of various sizes. The growth in the manufacturing of newspaper pouches can provide employment to various men and women and help them sustain their livelihood. The depth lies in the fact that how much are we putting in to become a environment conscious customer who also cares about aesthetics and quality and demand for a product that takes us back to the healthy and clean indigenous societies we come from! You can do even more good by just walking and getting a paper bag than driving to get a plastic one! Using such newspaper pouches will be our help to nature, societies and people! READ Best Movie Companion, A Large Popcorn Bucket! Previous articleSynthetic Biology Has Emerged To Rejuvenate Our Environment! Next articleHave Your Own Eco-Friendly Spoon Set! Don’t Throw Forests down the bins each day! Choose Recycled Tissue Papers!